UNCOOL: Fearne Cotton: WHY? | Everything is cool. The UK is currently having a cool moment. Robbie’s rejoined Take That, Samantha Cameron’s given birth to a bouncing baby girl, Cheryl’s going to collapse in next week’s X Factor – that’s exciting – and it turns out the BBC aren’t going to make us wait ages till they show Mad Men series 4 after all [which, by the way, we’ll have finished watching online when that day comes]. However, just to ruin this sequence of good things that are happening, something that is still ‘happening’ in spite of the thousands of people who devote their precious time working towards the abolition of it – is Fearne Cotton. I suppose Cotton is what they call an ‘unstoppable force’ in the entertainment industry, and in normal terms a bit like multi purpose cleaner. It does the job – but what the hell IS IT? If you don’t know the amaaaayzing story of Fearne, here it is: she was discovered in 1996 during GMTV’s nationwide search for an adjective obsessed teenager. After reciting one hundred of her favourite adjectives, among which included fantastic, brilliant, wicked, mega and magic, they made her a presenter on Diggit – a weird kids programme which replaced The Disney Club. Following that were a series of odd jobs on programmes like Smile, The Monday, Tuesday, Wednesday, Thursday, Friday and Saturday Show. Sunday was her day of rest. Yes, she used to rest. Having taken over Jo Whiley’s Radio One slot, Cotton now gets to exercise her love of adjectives during telephone conversations with children who ring in to let her know what they’re up to. And what a let down to have your favourite radio dj burst your bubble like that with those adjectivious outbursts and falsehearted questions. The tone reminiscent of those last few minutes on the phone to your senile gran. But who can blame her? What 27 year old woman in her right mind, whose fashion faux pas and hoarse voice are complained about daily, would want to talk drivel with teenage girls? Well, it turns out it really is Fearne. 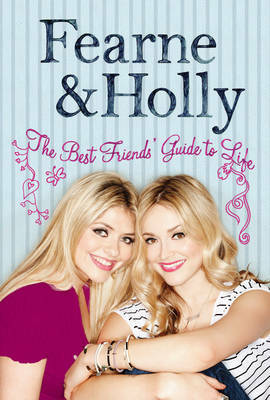 Predictably and yet unbelieeeeeevably, Cotton and best mate Holly Willoughby have written an advice manual entitled The Best Friends’ Guide to Life. I’m not mucking about. And which ITV career assassin’s idea was this? The book will be a humiliation to anyone who’s ever had a friend, and is 200% certain to cause problems in the playground. The average thirteen year old girl has at least, like, sixty best friends but, on receipt of the Life Guide which requires, like, two lives to guide, will have no choice but to send a text to, like, the other fifty-nine poor blighters letting them down gently ’til there’s just one; a Holly to her Fearne. A.may.zing. Sometimes I look at Fearne and see my boyfriend’s sister; a warm hearted, intelligent, down to earth human being. She also works in TV. Maybe she could give Fearne some lessons on, I don’t know, TV. I know there are people out there like me, whose fingers quiver as they approach the radio’s on/off button, who, like me, have boycotted all cable channels ending in the number 2. Single handedly, without Holly, Fearne Cotton is thawing this cool moment we’re having and I for one am scared of how it will end. note your stuff previous to and you are simply extremely magnificent. You’re making it entertaining and you continue to take care of to keep it smart. I can not wait to learn much more from you. This is actually a terrific website.